I've always wanted to go to the Albuquerque New Mexico Hot-Air Balloon Festival - held in early October, hundreds of balloonists from countries all over the world attend. 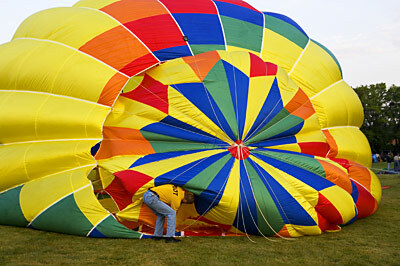 See http://gosw.about.com/od/newmexicotravelguide/a/balloonfiesta.htm for more on the Albuquerque Festival. Well, I've not yet been able to be there for one reason or another. 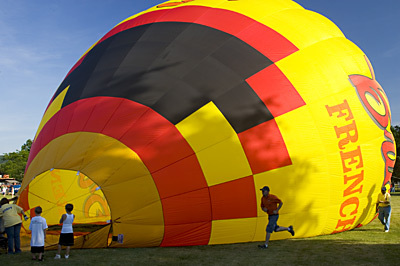 So, my best alternative is the York County Hot-Air Balloon Festival held every year in mid-June at a local county park. This year there were some 20-30 balloonists attending. 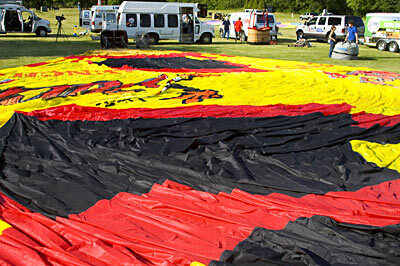 See http://www.inyork.com/entertainment/ci_3940491 and http://www.windjammerballoons.com/festival/schedule.shtml for more info. 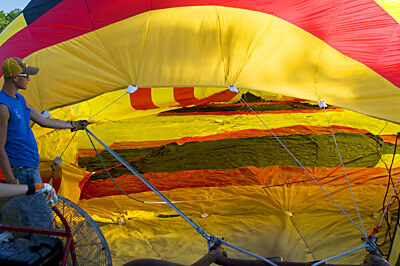 So how does a hot-air balloon work? Simple physics actually - hot-air rises. 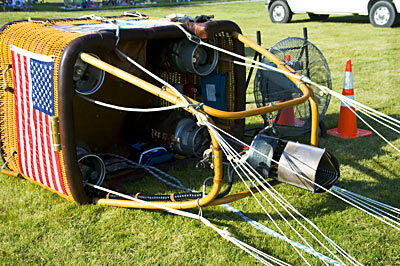 So if you contain the hot air in the balloon, it will rise taking the balloon and whatever is attached up in the air. Of course, the cooler the ambient temperate, the faster the rise. So mostly, you'll see balloonists taking off in the early morning at or slightly before sunrise, or in the evening an hour or so before sunset when the ambient temperatures are cooler. So how do they get those balloons in the air? Well, first ya gotta lay the thing out on the ground and sort out all the ropes and lines. This one is sponsored by Bricker's Fries - a local french fry tradition. This one is typical - about 80' tall once inflated. Here's the basket. 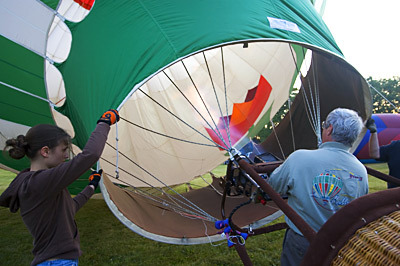 The larger balloons have a square basket that holds about four people. Here you can see the propane tanks - four of 'em - one in each corner, and the burner at the top of the basket. Larger balloons will have two burners, larger baskets and more propane capacity. Of course, smaller balloons . . .
To your right of the basket is a gas powered fan that's used for the initial inflation. 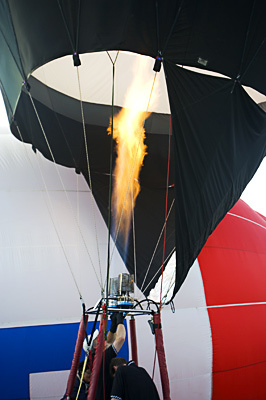 You have to get a lot of air in the balloon before you fire up the burner - otherwise you risk toasting the fabric. Here the balloon is being inflated by the gasoline powered fan - see it at the lower left. Still being inflated by the fan - workers run around straightening the fabric and the lines. Of course the press shows up. 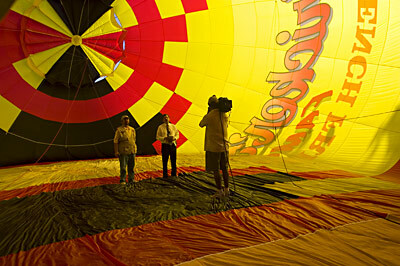 Here we have a TV interview being conducted inside the balloon. I believe these guys are from FOX 43. Note the rapid deflation panel at the top. Once fully inflated with cool air, it's time to heat it up a little. The propane burner is fired up - you can just see the blue and yellow flame on this one - and the balloon starts to rise to a vertical position. Once vertical, the burner is really fired up to start the levitation tricks!